It's not very often that an important new work about Jack Kerouac surfaces, but that is exactly what we can anticipate with the August 29 publication of Mañana Means Heaven by award-winning author Tim Z. Hernandez. I had the privilege of reading an "advance reading copy/uncorrected proof" thanks to the University of Arizona Press. In Mañana Means Heaven, according to the back cover, Hernandez "weaves a rich and visionary portrait of Bea Franco, the real woman behind famed American author Jack Kerouac's 'The Mexican Girl'" [from On the Road and also appearing as a short story by that title in The Paris Review in 1956]. We all know how book covers can exaggerate, but this is one time when it's quite accurate: Hernandez does a brilliant job crafting an engaging and creative counter-narrative, fleshing out Kerouac's self-centered story about Bea Franco (the fictional "Terry") with details from his own imagination, experience (he grew up in the same geographical area and culture as Bea), and, his research into and interviews with Bea Franco herself. Mañana Means Heaven is a mesmerizing story. There is no need to be a Kerouac fan or know anything about Kerouac in order to enjoy the novel thoroughly. 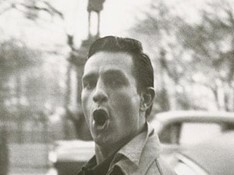 If you happen to be a Kerouac fan, you will be especially thrilled. 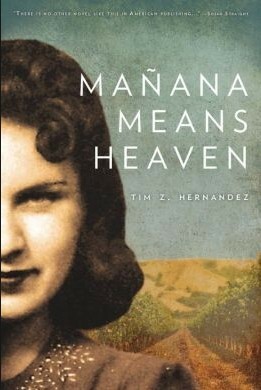 Interestingly, Hernandez takes a page out of Jack's own handbook and writes Mañana Means Heaven in a roman à clef style, seamlessly weaving together fiction and facts to present a compelling story. Using well-honed descriptive powers, Hernandez gives us an intimate look at the several weeks (described it as fifteen days in On the Road) Kerouac spent with Bea in southern California, particularly emphasizing Bea's perspective. Having grown up in similar circumstances, Hernandez is uniquely able to paint a vivid and realistic portrait of the characters as well as the settings and culture that provide the context for the story. I can hear Kerouac saying something like that. Over the next few minutes Bea continued to steal glances at him from the corner of her eye. She couldn't help but think of how wrong her first impression of him had been. At the diner, slumped over the counter scratching into his paper, he came across awkward, troubled almost. But now, sitting here beside him she could see that he was nothing of the sort. There was a sensitivity about him, a timidity disguised beneath a layer of denim and tobacco smoke. Nothing like the men at the campo or in the fields, who, upon hearing of Bea's troubled marriage, often tried luring her with sweet talk of money and sexual escapades. Perros. The kind of men who bunked a dozen to a tent and stayed up talking about the women they'd balled in their short and lonely lives (p. 31). Hernandez spends 162 pages fictionalizing the time Kerouac spent with Bea, a story Kerouac presents in a scant 19 pages in my copy of On the Road. This gives an idea of how much Hernandez embellishes the story with his own insights and experience as well as information from his research into Bea and his interviews with her. Whereas Kerouac provides no details on what happened to Bea after he left for New York City (he merely mentions her with regret a couple of times), Hernandez spends 44 pages on Bea's experience after Kerouac's departure, including her going to Denver, living in a hotel and working as a waitress in order to look for Kerouac, who had written her that he'd be there (you'll have to read the book to see if she found him). This section of the book includes four actual letters from Bea to Kerouac. There is an 11 page Afterword describing Hernandez' fascinating odyssey researching Bea and ultimately finding her living one mile from his home! He was able to interview her multiple times with the assistance of her son, Albert, and daughter, Patricia. Bea turned 90 during the period of time when the interviews took place. This section includes pictures of Bea and Al from 1942, Al circa 1950, and Bea and sister Angie from 1947. When I first read Hernandez' description of his elation on finally finding Bea on September 11, 2010, it brought tears to my eyes. This is certainly related to my own obsession with Kerouac, but it is also evidence of some powerful writing. One clever device employed by Hernandez was opening the book with a description of his last interview with Bea on October 13, 2010 and closing the book with a slightly different description of the same interview. The first entry acted as a teaser yet didn't give away the show, plus the two passages nicely demonstrate that narratives have an infinite number of ways to be presented, depending on the writer, the audience, the purpose, etc. "Sure, baby, mañana." It was always mañana. For the next week that was all I heard–mañana, a lovely word and one that probably means heaven (p. 94). Unless I missed it, Hernandez never makes the connection between mañana (which literally means "tomorrow") and heaven explicit like Kerouac does, but he does make it implicitly clear in the narrative. However an adult decided to use that word, there was one thing little Albert was sure of–the word itself carried weight. But for all the times he'd heard it uttered, spat, or mumbled, in that moment, cruising up the long, dark road, when it came from his uncle's mouth, mañana, it no longer sounded like something a person just said. No, in that moment, it sounded like a possibility, a promise of things to come (pp. 188-189). For me, the true measure of a book is my reaction when I read the last word. In this case, mine was, "What? No more? I want to keep reading about Bea's life!" Such was my level of involvement with the story. I highly, highly recommend this book whether or not you are a Kerouac fan. With Mañana Means Heaven, Tim Z. Hernandez has created an important entry for the Kerouac canon that also stands on its own merits as a well-crafted novel about love and loss. Bravo. *All excerpts from from Mañana Means Heaven by Tim Z. Hernandez © 2013 Tim Z. Hernandez. Reprinted by permission of the University of Arizona Press. Great review! I too read the advance and greatly enjoyed it. I agree with your sentiment that it's "important entry for the Kerouac canon that also stands on its own merits as a well-crafted novel." Gerald Nicosia, author of the acclaimed Kerouac biography Memory Babe, said The Beat Handbook is "full of Jack's heart." 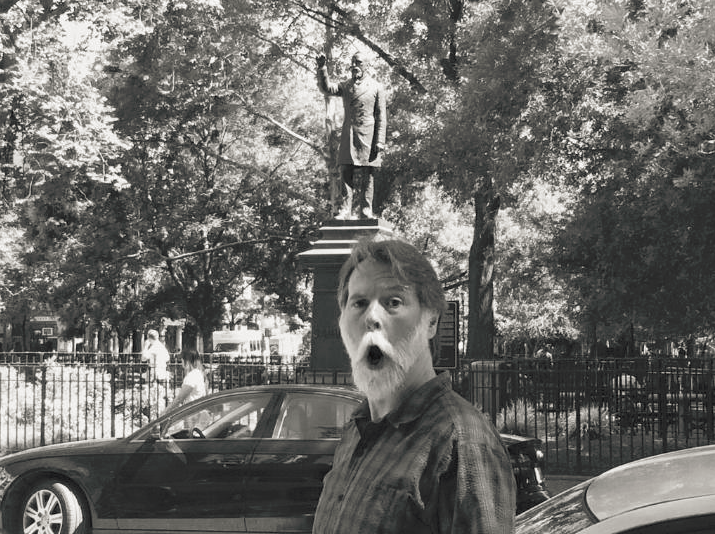 Jared Randall, author of the excellent book of poetry, Apocryphal Road Code, said this about The Beat Handbook: "Sometimes a book comes along at just the right time. In my wandering pack of experiences, I find they often do. Enter The Beat Handbook by Rick Dale." "I just finished reading Rick Dale's beautiful utterance and call to action of Kerouac mind-set and zen sensibilities. It made me laugh and reflect on my own life and road I have naturally grooved into after absorbing the Kerouac canon. The road less traveled always had my name on it. And that has made all the difference. The Beat Handbook 100 Days of Kerouactions reaffirms the attitudes and ideology that made the Beats and Kerouac the important men of ideas that America (and the world) thirsted for, needed, and swallowed whole. Beautiful, absorbing, Top Ten whipsmart from my articulate, tender-hearted friend and fellow traveler. Highly recommended." 1. Anonymous comments will not be published. 2. Comments unrelated to the target post will not be published. 3. Snark and ad hominem comments will not be published. (c) 2013 Rick Dale. Awesome Inc. theme. Powered by Blogger.